I suspect I’m going to shock a few people with this post. Earlier this week the Belorussian shot putter Nadzeya Ostapchuk was stripped of her Olympic gold medal after testing positive for the banned anabolic steroid metenolone. Disgraceful as this may be let’s put it in context. Ostapchuk only took performance enhancing drugs. During my ascent of Elbrus, the highest mountain in Europe, last month I took not only performance enhancing drugs (aspirin, diamox and – I’m told – Russian vodka) but a cable car, a chairlift and, most shocking of all, a snow cat (that’s a tracked vehicle, not a clawed feline). 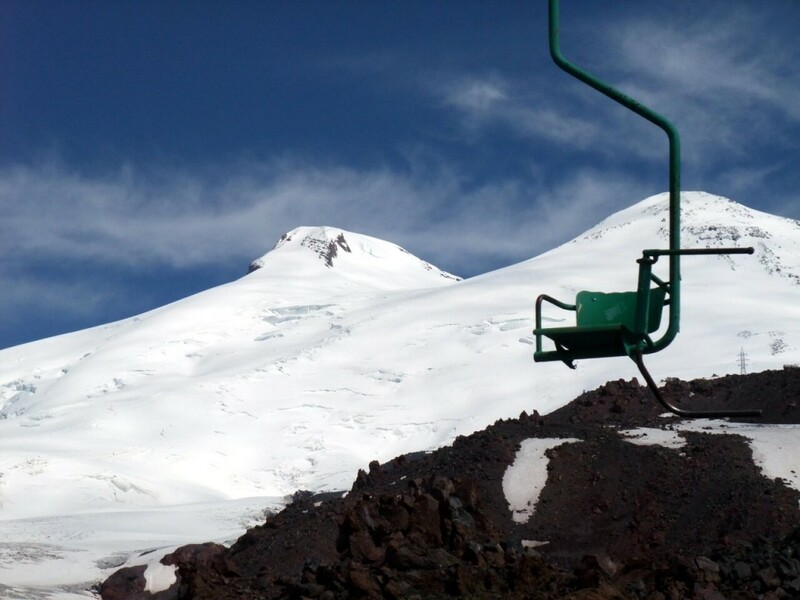 Surely getting the chairlift up Elbrus is cheating? Cheating, surely? Perhaps, but it depends what rules you’re playing to and who the losers are. Let me explain. 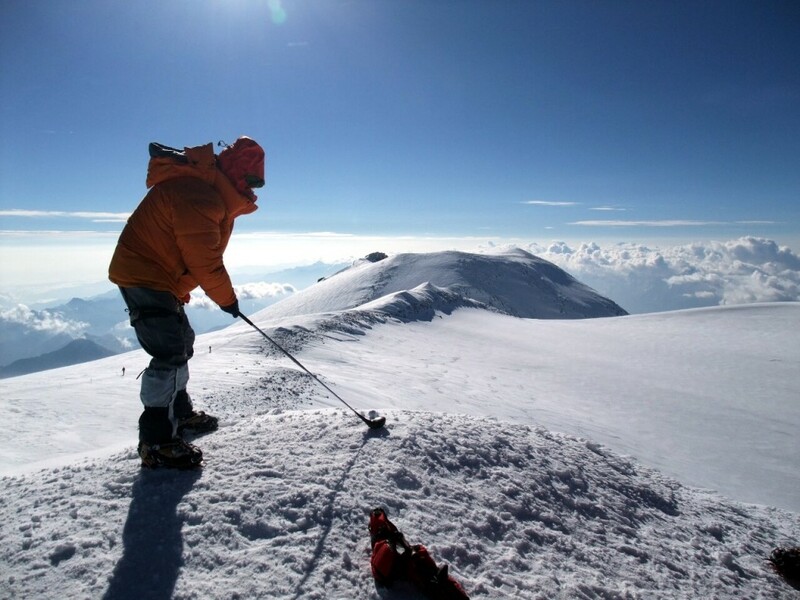 For various reasons which I outlined in a previous post, I chose the Russian 7 Summits Club as the tour operator for my climb, a mountaineering company specialising in expeditions to the highest mountain on each continent. Although they operate worldwide and make provision for English speaking climbers, their client-base is overwhelmingly Russian. As it happened I was the only non-Russian client, and as I don’t speak a word of Russian apart from pazhalysta (please), spasiba (thank you) and pivo (beer), this made for an interesting experience, although it wasn’t to stop me climbing the mountain. 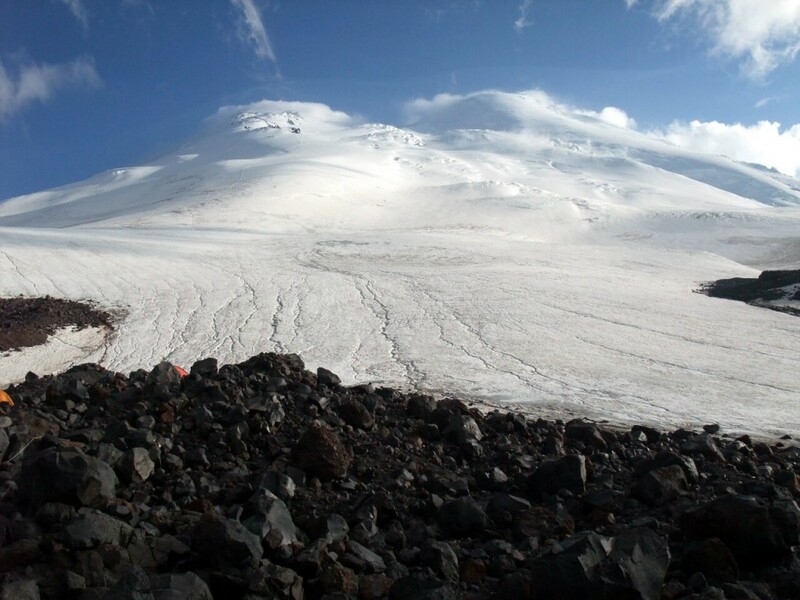 Elbrus is a curiously incongruous mountain, a dormant volcano standing on the northern fringes of the Caucasus Mountains. 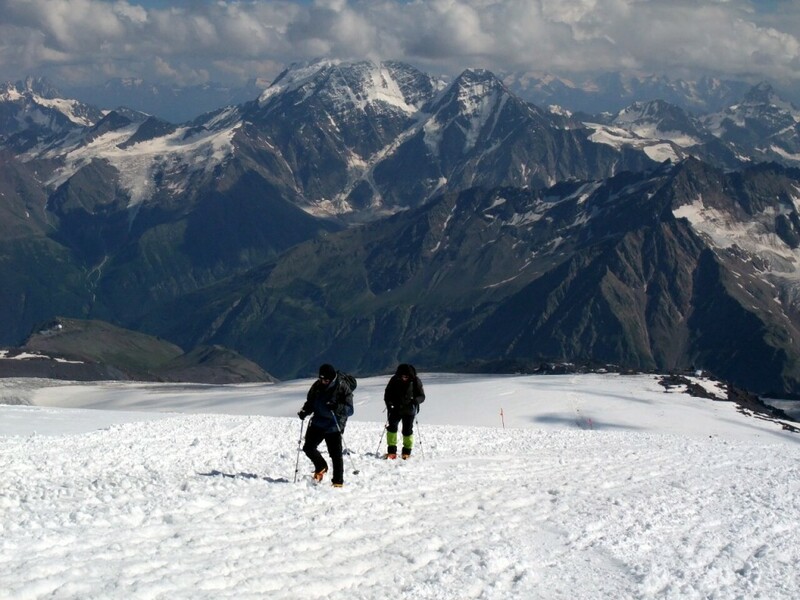 Its twin summits tower over all the mountains surrounding it by more than 1000 metres, yet its gentle snow slopes make it a much less intimidating proposition than the rest of the Caucasus Range to the south, which consist of jagged rocky summits, narrow ridges and steep hanging glaciers. To its north the land drops away to an open landscape of rolling green foothills. 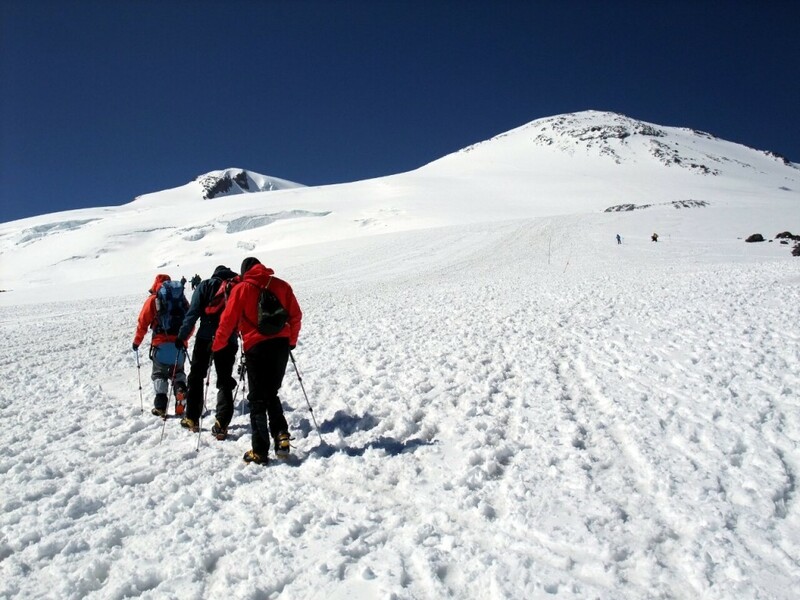 Most people climb Elbrus by one of two routes, the northern route through a wide and remote landcape of rolling green hills, and the southern one, from the narrow Baksan Valley which backs onto the rest of the Caucasus Range. While the first route provides a true wilderness experience, the second couldn’t be more different. Pine groves and tourist villages line the Baksan Valley, and at the top end a cable car takes you from the village of Azau at 2400m to 3400m in a matter of minutes. It doesn’t end there. A chairlift takes you even higher to Barrels, a collection of barrel-shaped climbing huts on the edge of the snowline at 3700m. Here a canteen serves hot meals, and a snow cat service is available to drive you even higher up the snow slopes, which contain further huts all the way to 4200m. Our plan was to do a full traverse of the mountain from the south side, climb the main summit and descend down the northern route. We spent a couple of days acclimatising in the village of Cheget, a tiny ski resort in the Baksan Valley. 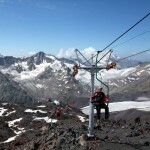 On the first day we took a chairlift up a ridge on the opposite side of the valley from Elbrus for an acclimatisation walk. It was wet and misty and we saw nothing of the mountain. We later learned that nobody summitted Elbrus that day. Back at the hotel I discovered my three companions for the traverse Sergei, Vitali and Kyrill, were all keen to climb both summits. Since we were all experienced climbers (Sergei and Vitali had both been on Denali this year while Kyrill, like me, had been on Everest) our guide Luda, the wife of 7 Summits Club owner Alex Abramov, agreed to give it a go. This was going to make for a long summit day, however, and because we were traversing the mountain we would need to carry all our kit. 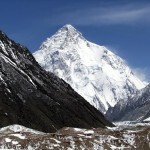 Most people climb from a feature on the snow slopes known as Pastukhov Rocks at around 4700m. From there it’s a snow slog up to the saddle between the two summits at 5350m. We could leave our packs at the saddle while we climbed the 5642m West Peak, but would need to carry them up and over the 5621m East Peak before descending to 3800m on the north side. None of us particularly relished that long slog up to the saddle, which would be an exercise in endurance rather than an enjoyable climb, so we agreed to take the snow cat as high as we could. The following day produced the best weather of the week. It was also our longest day as we drove up the valley to Azau, loaded all our kit into the cable car and headed up to Barrels. The one-seater chairlift for the final 300 metres was neither the most efficient nor the safest method of transporting equipment, but it’s apparent that quite a lot kit gets carried in this way, balancing on a chair twenty metres above the ground. I imagined there were a lot of accidents, but I saw no shattered equipment on the ground below me when it was my turn to ascend. In the afternoon that day we had a magnificent acclimatisation walk all the way from Barrels at 3700m up the snow slopes to Pastukhov Rocks at 4700m. It was further than I was expecting to go and only a handful of us made it that far, but it was great acclimatisation, the weather held fair, and was some mitigation for the fact we would be travelling by snow cat next time we did that journey. The views south across the Caucasus were splendid, and it’s strange to think we had a straightforward climb up Elbrus while the mountains far below looked supremely technical, but such is the nature of volcanoes. The majority of the Caucasus were formed by plate collision rather than thermal activity, and it produces a very different profile of mountain. We had a rest day the following day and Sergei, Vitali and Kyrill took me down to Azau on the cable car where they suggested the best way to prepare for the climb was by filling ourselves with beer. The Russians certainly know how to drink, and will come up with any excuse for a toast. Most dinner times a bottle of vodka was passed around, and any inclination I might have to refuse was immediately countered by Alex with the words “it’s good for acclimatisation” in his deep Russian voice. So as you can see I had no choice. Three relays of snow cat took us up the mountain on our summit day of August 2, and deposited us on the traverse beneath East Peak at 5am. About 15 climbers had chosen this means of transport and it was not a comfortable experience. The angle of ascent was such that whoever sat at the back would invariably be squashed beneath a pile of bodies by the time the journey ended and we boarded the next vehicle waiting for us. There was always a trekking pole or two wedged into some crevice by the end, and you had to keep your fingers crossed it wasn’t your own. At one point I noticed some climbers jumping out of the way as our vehicle passed them, and I can only imagine the words of contempt going through their minds. Did I feel guilty? In a word, no. Lots of people use cable cars and funicular railways to take them higher up mountains in the Alps and think of it as adding value to their trips rather than cheating, eliminating the tedious parts of the climb. Nobody seems to mind driving up to the Pen y Pass car park on Snowdon rather than climbing it from sea level, and on Everest the lowest anyone climbs from is the air strip in Lukla at 2800m. By the end of the day the snow cat would be long forgotten and I would certainly feel like I had been in a climb. I know there will be many people reading who disagree with this, and I have no doubt all those people climbing from the north side will have had a more rewarding time of it. But life’s all about experiences, and there’s no need to make hard and fast rules. One of the things I love about mountaineering is that every mountain’s different. I’ve had plenty of 1000 metre snow slogs; the snow cat was definitely something new to me. I wouldn’t rule out taking the train up Snowdon some day either. Teeing off from West Peak. The golf ball wasn’t in any danger of hitting climbers on East Peak. For the time being I was happy to read 5100m on my altimeter, and Luda led off the five of us who were doing the traverse. To begin with we climbed the slopes underneath East Peak where we had been deposited. It was cold and windy, but it was relatively clear: not a perfect summit day but good enough if you’re suitably attired for cold weather. The forecast had predicted temperatures as low as -26° C with the wind chill and this seemed not far off the mark. There had been a few inches of fresh snow overnight and we took it in turns to break trail initially. As we climbed higher though it was obvious Luda was much stronger at altitude, and eventually she took over the lead again. We were all climbing with trekking poles, but as we traversed below the East Peak there were times when I looked at the slope to my left and wished I was holding my ice axe instead. There would be no way of arresting with a pole, and although the slope became gentler lower down it was 1300 metres down to Barrels with nothing in between. We reached the saddle at 7am and dumped our packs to climb West Peak to our left. The sun hit the slopes about 50 metres above us, so we put on sun cream and sunglasses, but the wind was bitter, often blowing spindrift into our faces, and there was no question of removing down jackets and mitts. It took us little more than an hour to reach the highest point in Europe. The trail angled steeply up the dome of West Peak and we stopped every few paces to regain our breath. Although the climbing wasn’t difficult, this was only our fourth day at high altitude, the quickest I’ve ever come to this altitude before, and we certainly weren’t fully acclimatised. This was evident when a 70 year old Austrian man overtook us a little short of the summit (not the first septuagenarian to beat me to the top of a mountain this year – a 73 year old Japanese woman summitted Everest on the same day that I did). The summit of West Peak lies at the far end of a short plateau. The wind was at its fiercest here, but a short rise of about 5 metres took us up to the top, which we reached at 8.30. I don’t condone littering the summits of mountains, but somewhere on that plateau are three golf balls left behind by my companions. Sergei produced his driver and they each took a swing. I dare say the thin air and spindrift affects your stroke, but I don’t think they’ll be challenging Tiger Woods any time soon. By 9.30 we were back down at the saddle where another guide called Andrei was waiting to join us for the rest of the traverse. He led the way up East Peak as the weather started to change. The wind continued to rage and blow spindrift into our faces, but now the clouds descended as well and reduced visibility to a few dozen metres. Progress was very slow. There was no established trail up East Peak from the saddle because few people climb both peaks in one go, and most who climb East Peak ascend directly from the north. Andrei was making his way slowly between rock bands, but behind him I was dropping behind as I battled my way into the teeth of the gale. At one point we had to take shelter behind a large rock as we waited for the wind to subside. The upper part of the climb was a series of zigzags up a broad snow slope, and we reached the summit at midday. Still the wind raged, and while we enjoyed clear views from the summit of West Peak, on East Peak we were in cloud and could see nothing. We took a few quick summit photos before Andrei led us down the main trail on the north side. We had to descend 1000 metres before we emerged from cloud. The snow was deep and it wasn’t a comfortable descent, but the route on the north side was more interesting, with a series of rock bands to weave between. We roped up for the last 800 metres as there were some small hidden crevasses. Andrei set a punishing pace, but on the rope I had no choice but to keep up. Below the clouds the sun was shining and I sweated profusely in my layers, but we could see the huts below us on the edge of the snowline, and we reached them at 3.30. I was parched with thirst, having nursed 1.5 litres, but a series of ice cool glacier streams cascaded beneath the ice and I was able to refill my bottles. Later that evening the clouds diminished briefly and we had a reasonable view of both summits from the north side, one of the few we were to have. We still had another 1200m to descend the following day to the trailhead at Emmanuel Glade, but the terrain was altogether more pleasing on this side of the mountain. We crossed a sloping plateau dappled with tiny white and yellow flowers and descended into grassy hills with rocky outcrops. Andrei continued at a rapid pace and I struggled to keep up, but I didn’t want to slow anyone down. The flatter sections were harder than the steep hills, since when the terrain eased Andrei was virtually running. I assumed there must be a vodka fountain at the trailhead, but instead we were presented with a huge watermelon to share between us. It was the size of two human heads, and they kept giving me foot long slices to gnaw on. I’ve never eaten so much watermelon in my life. But perhaps the speed descent made up for the cheating ascent by snow cat. It hadn’t been the most challenging mountain I’ve ever climbed, but there were some interesting experiences along the way. 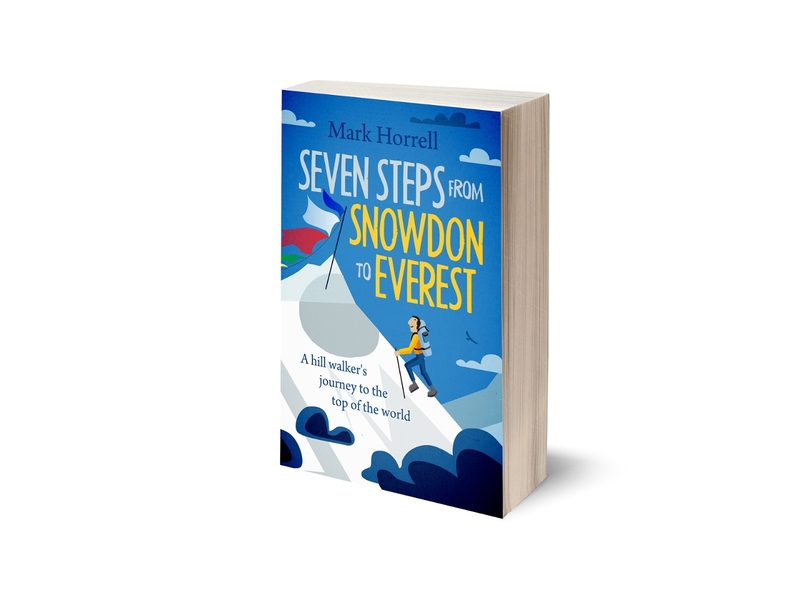 Would I recommend 7 Summits Club as a mountaineering operator? 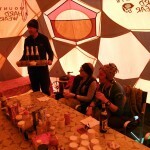 There’s no doubt that they run a very well-organised trip with experienced guides. It probably helped that ours were Alex and Luda, and their flexibility in taking us up both summits when they realised we had a strong team is commendable. The language barrier was an issue, though. It can sometimes be more lonely sitting at a table with people and not understanding a word they are saying, than it can be sitting by yourself with your own thoughts for company. There was no doubt my instructions were shorter than everybody else’s, and often I missed out on minor but crucial information such as what time we were having breakfast and how to obtain drinking water. Luckily the climb was straightforward for me and I didn’t often need to ask for advice, but if I was less experienced or a worrier then it would certainly have been more of a problem. For the seven summits themselves there are plenty of operators running English-only expeditions with English-speaking clients who would be far more suitable, unless you speak Russian. 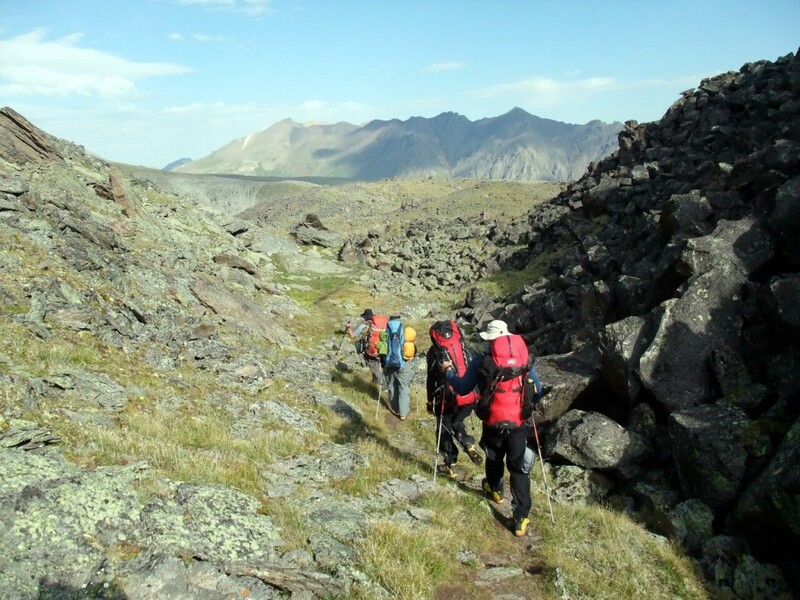 But 7 Summits Club also run an interesting range of expeditions to many places other operators don’t, for example the “Snow Leopard Peaks” (five mountains in Central Asia over 7000m). It’s highly likely I will travel with them again in the future. 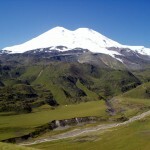 You can see the rest of my photos here, and I’ll finish with a short video: Elbrus the modern way. i refused the snow cat, we went from the barrels on ski’s took 12 bloody hours to summit but the ski down was awesome and only an hour and a half down. I’m not a skier, but I imagine it would be a good run, 1900m of it down to Barrels. 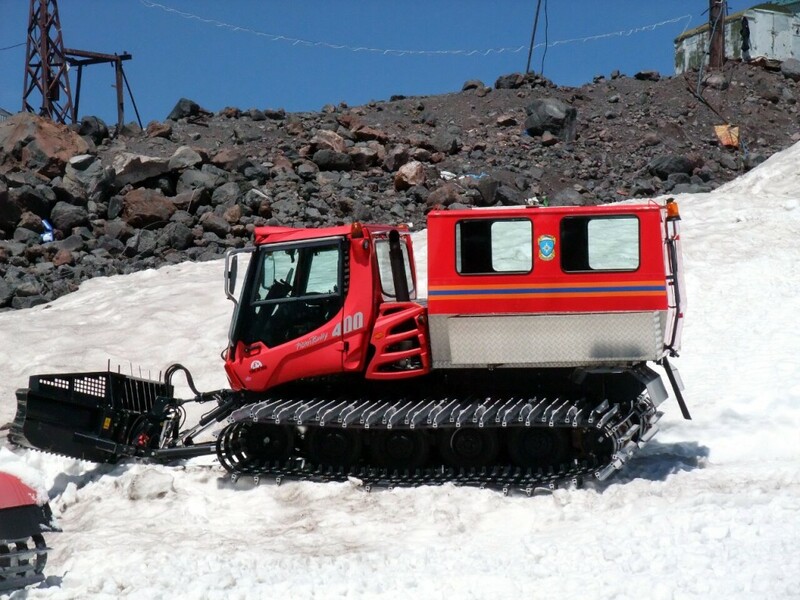 I have no regrets about using the snow cat, though – that would be 12 pretty monotonous hours, and it enabled us to do both summits and traverse to the north side in a single day. Congratulations on your Seven Summits. I’d love to hear more about it – were you on Vinson with Robert over Xmas, or is this the only nugget I’m going to get?